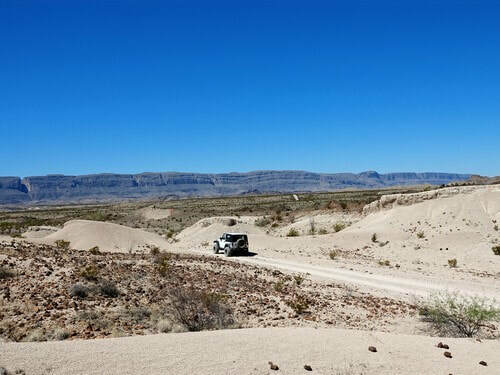 ​River Road is a 52 mile primitive road running roughly between Rio Grande Village and Castolon. There are many interesting things along the trail. 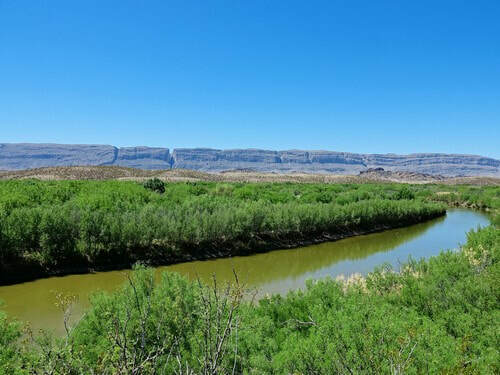 Parts of this trail parallel the Rio Grande, but most of it is quite a distance from the river. The river is only visible from the road at one spot on the western half of the route. The eastern part of the trail as far as the road to Tally is rated GP and can be driven by most vehicles. The western part requires somewhat higher clearance and is rough enough to be rated 2.0. There are many side roads that go to, or near to, the river but this page includes only what we thought interesting. 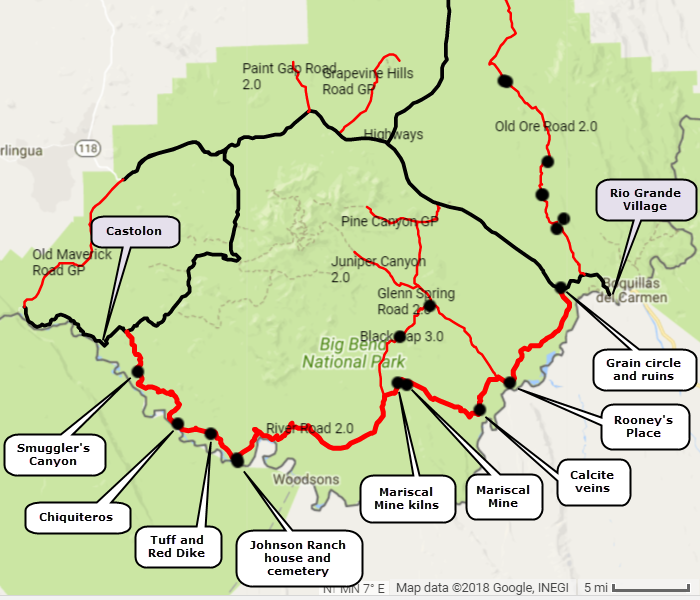 This run is described east to west, but the trail can be driven either way. Almost as soon as you start there is a wide spot to park and visit two attractions. 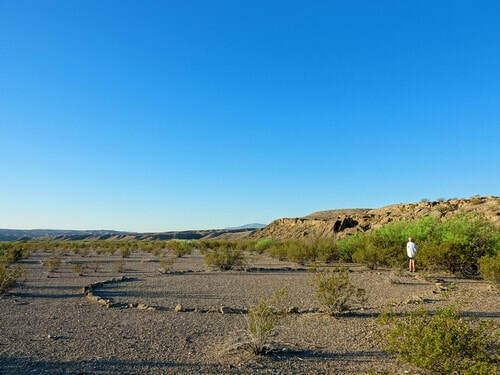 The rock circle on your left is an old threshing floor used for threshing grain used by the Mexican people that lived here. Originally a post stood in the center of the circle; to this were harnessed several burros, harnessed side by side, that were driven around and around over the grain to thresh out the wheat. The chaff and trash were winnowed from the grain by throwing the crushed straw into the wind and catching the grain on a blanket. 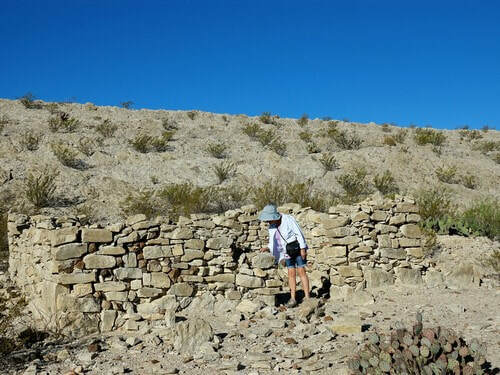 Scramble up the bank on the right side to see the ruins of rock houses inhabited as late as 1936. ​Use the waypoint to find where to park for Rooney’s Place. Walk less than a half mile down a closed road to the remains of Rooney’s Place. 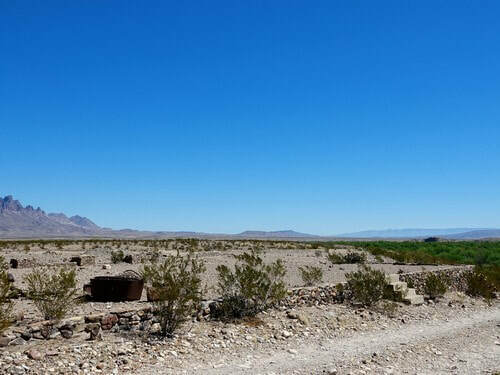 Ruins we call “Rooney’s Guest house” are located a bit west of this closed road and can be visited with a short walk across the desert. 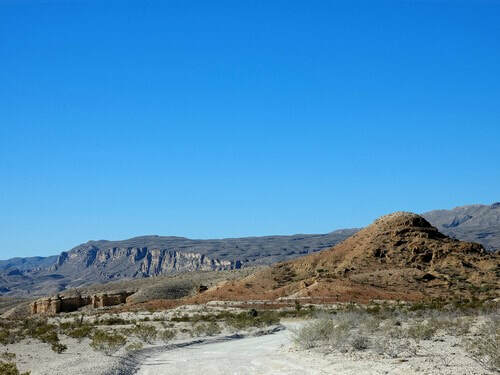 ​Continue a scenic trip beyond Rooney’s Place to see an interesting rock face veined with calcite. 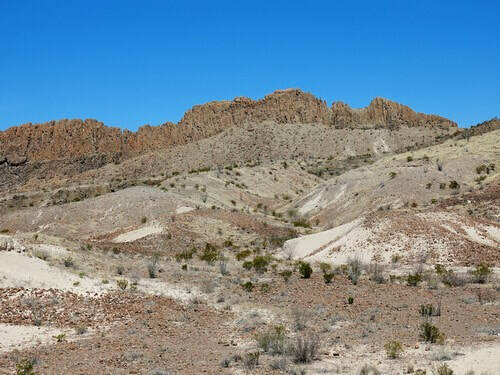 These soft, crystalline veins occur in igneous analcite-bearing rock that forms small laccoliths, sills and dikes in the Big Bend area. 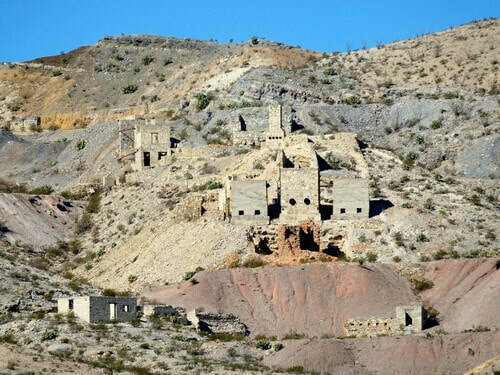 The Mariscal Mine was a source of cinnabar, or quicksilver, ore that was refined into mercury. 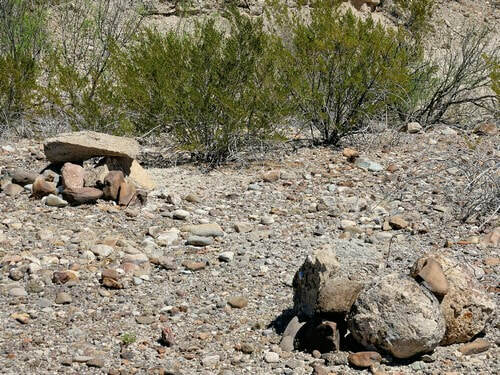 Early owners shipped ore by burro train to Terlingua for refining. Later owners built a refinery on site. The mine closed in the 1920’s then reopened for a short time in 1942 and 1943. 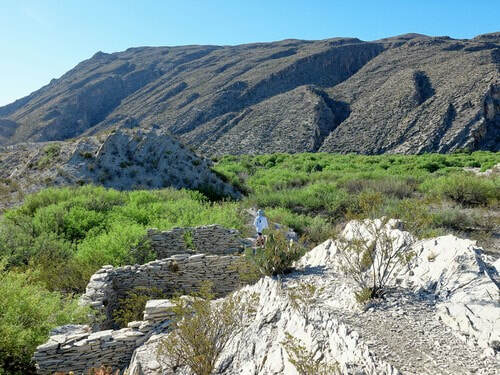 It is reported to be the best preserved mercury mining site in Texas. A short distance away is where wood burning kilns produced bricks for the Scott furnace at Mariscal Mine. There is not much left except rubble. Johnson’s Ranch was a combination trading post, cotton farm and goat ranch. The US Army had 3 landing strips here in the 1940’s. 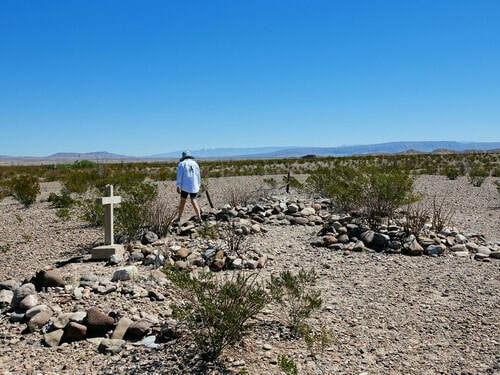 There is a graveyard near River Road and large foundation at the end of the spur road. Soft white rock seen occasionally throughout the area is tuff, a compressed volcanic ash. 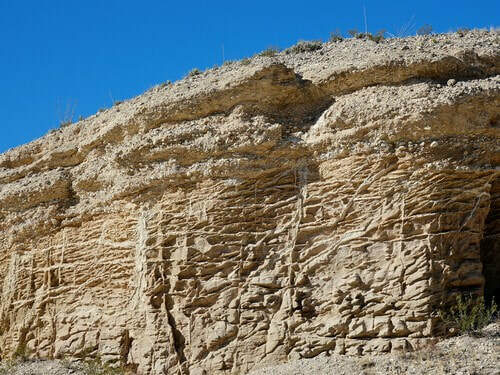 The high wall north of the tuff is a huge dike, called Red Dike, formed by magma that filled a crack in the earth millions of years ago. 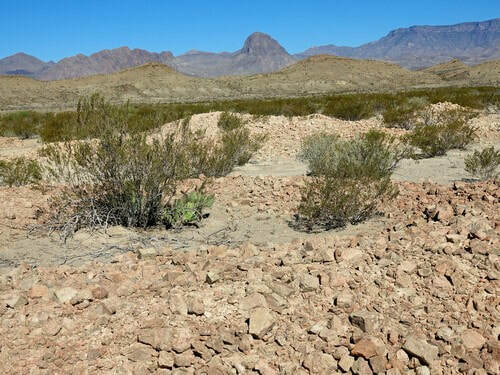 West of Black Dike are a number of little piles of rock on the south side of the road. These are kidhouses or “chiquiteros”. Kid goats were tied by the foot with a cord and staked near the shelters. During the hottest part of the day they crawled under the rocks for shade. The nannies were herded out to graze during the day and brought back at night to nurse their young. 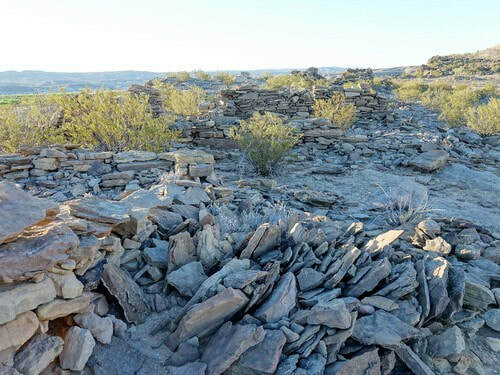 The remains of the goatherd house can also be seen. 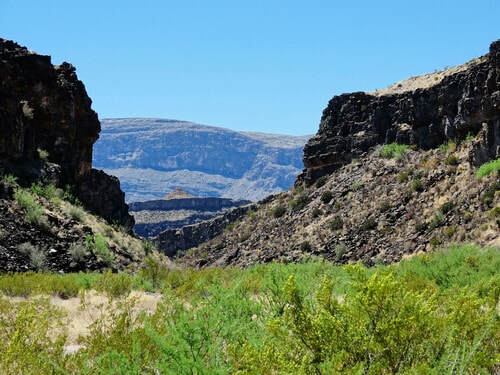 Smuggler’s Canyon, leading to the Rio Grande, was used by smugglers carrying contraband to Mexico.